Scientifically referred to as Phacochoerus africanus, the common warthog is noted to be a wild member of pig family that is spread in the savannah, grassland and the Sub Saharan woodland. The common warthog is noted to be Species of medium size extending from 0.9 – 1.5m in length and 63.5 – 85cm at the shoulder height. The females tend to be smaller in size than the males stretching from 45 – 75kg in weight while males stretch from 60 – 150kg. The Warthog is identified by the 2 pairs of tusks that protrude from the mouth before they curve upwards. The lower pair is shorter than the upper pair but very sharp as it rubs it against the upper pair each time the warthog opens and closes its mouth. The upper canines grow up to 25.5cm in length and feature a squashed shape in cross section close to being rectangle shape and around 4.5 deep and 2.5cm wide. It can be noted that the tusk of a warthog curves 90 degrees or more right from the root and cannot lie flat if placed on table. It curves backwards as it grows as can be explored on Uganda safaris. The warthog make use of their tusks to dig, combat with other hogs and defense against the predators. The lower set can inflict a range of wounds on the attacker. The continuously growing warthog canine teeth forms ivory that is normally put to use in crafting a range of items most of which are souvenirs for trade to the world travelers including those that undertake safaris in Uganda. The head of the warthog is gigantic featuring a mane down the spine to the center of the back while the body is covered by sparse hair while the color is normally black or brown. The tails of warthogs are long and have a tuft hair at the end. These Species do not contain subcutaneous fat and with sparse coat, the warthogs are prone to enormous temperatures of the environment. The warthogs are omnivores and its diet features roots, grasses, fruits and berries, fungi, bark, eggs, insects and carrion. The diet varies depending on the different food availability. It can be noted that warthogs feed on short perennial grasses in the wet season while in the dry season, they feed on nutritious roots, Rhizoms and bulbs. They are noted to be strong diggers with their feet and snout. They normally bend their front feet backwards and then move around their wrists while feeding. The calloused pads which protect the wrists during such movement tend to form in the early stages of fetus development. It can be noted that though the warthogs dig their own burrows, they normally occupy the abandoned burrows of the Aardvarks. It enters the burrow in a reversed direction and the head remains facing the opening thus ready to jump out in case of any trouble. They wallow in the mud to adapt to the high temperatures and then huddle together to adapt to the low temperatures. Despite the fact that the warthogs have the capacity to fight, they can easily opt to run other than face the attacker. However, the male warthogs tend to fight aggressively in the period of mating. The major predators of warthogs include; lions, humans, leopards, hyenas and wild dogs not forgetting crocodiles. The cheetah can capture a warthog equivalent of its weight while the raptors like martial eagles and Verreaux’s eagle owls at times feast on piglets. But a female warthog with piglets can fight to death and at times it has been observed injuring even large predators. At times, the warthogs have been observed welcoming the vervet monkeys and the banded mongoose to groom them and get rid of ticks. Regarding the social behavior, it can be noted that warthogs are not territorial but they tend to inhabit a home range. They thrive in groups named sounders. The females tend to live in their natal groups but male warthogs tend to leave though they keep with in the home range. The sub adult males associate along with the bachelor groups and when they reach adulthood, they tend to live alone. The adult males can join the sounders only if there are estrous females. The warthogs feature two (2) facial glands namely; the sebaceous gland and the tusk gland. It is at 6 – 7 months that warthogs begin to mark and it can be noted that males mark more than the females marking the feeding and areas for sleeping not forgetting water holes. They also use tusk marking for the courtship, establishing status and displaying antagonistic behaviors as always encountered on safari in Uganda. It can be noted that warthogs breed seasonally with rutting commencing in the late rainy season or the early dry season while the birthing commences at the start of the next rainy season. The season of mating among the warthogs is known as overlap promiscuity. The males feature male ranges that overlap the female ranges while the daily behavior is unpredictable among the females. The boars apply 2 mating strategies through the rut. These include; the staying tactic where the boar stay and defend certain females or the resource valuable to them and the second one is roaming tactic where boars look out for the estrous sows and then struggle for them. The usual warthog gestation period takes 5 – 6 months and when they are close to giving birth, the sows temporally leave their families to farrow in a distinct hole. They normally give birth to 2 – 8 piglets and the sow would keep in a given hole for weeks attending to the young ones. Warthogs also practice allosucking thus other sows can raise the piglets of one if she happens to pass away. The Piglets commence grazing at 2 – 3 weeks before weaning at 6 months. Regarding conservation, the most of the warthog population is concentrated in South of Africa and is estimated around 250,000. The warthogs are prone to drought and hunting by wild dogs which results into local extinction. 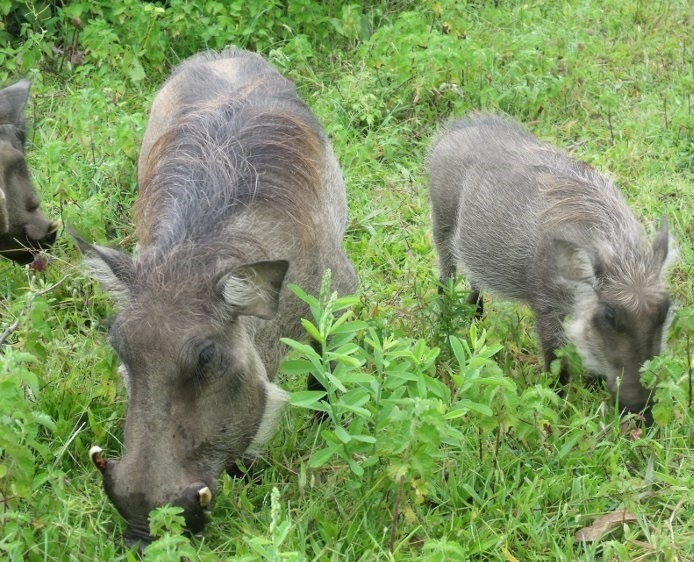 However, the common warthog is still present in various protected areas of Sub Saharan Africa including the Uganda safari destinations of Queen Elizabeth, Kidepo Valley, Murchison Falls and Lake Mburo National Parks among others.